A legendary reclusive filmmaker. An enigmatic cook and restaurant proprietor, who is clearly more than he seems. Two mysterious deliveries to be made behind the Iron Curtain. A desperate search for a long-missing old friend. An unexpected love affair on the coast of Normandy. Dallas Green’s life has only gotten more interesting in the years since his wild youthful adventure in Mexico, as told in the novel Maximilian and Carlotta Are Dead. In the year 1980, he is now a photographer, living and working in San Francisco, where he adjusts to a world very different from that of his rural roots. He may be older, but that does not necessarily mean he is any wiser, as his continuing romantic misadventures attest. 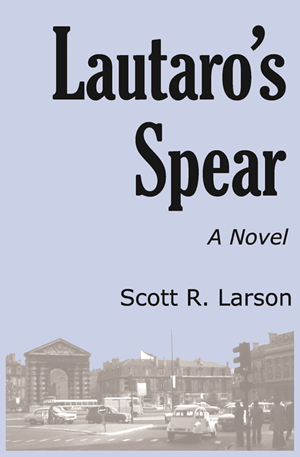 Lautaro’s Spear is Scott R. Larson’s third book, following the fantasy novel The Three Towers of Afranor. Yes, this means that another book is done and dusted. Officially, the release date is September 29, but I see the Kindle version is available already from Amazon’s US site. Other digital and paper versions should follow shortly. Links to the various sellers around the globe will be updated on my book blog, so check there if you are interested. Unlike the last book, this one takes place in the real world. Well, at least in a world as real as what goes on inside my head. The year is 1980, and the action moves from San Francisco to France to Germany and back again. This is a sequel to Maximilian and Carlotta Are Dead and follows the progress of that book’s misguided teenaged protagonist, Dallas Green, a few years later, as he negotiates his late twenties. I sometimes regret making Dallas the narrator of these books. It is actually a lot of work to write in character for nearly 300 pages while, at the same time, keeping the prose halfway readable. The reason I wrote the original novel in the first person was that I saw the book as my own personal Huckleberry Finn. If Mark Twain could write in Huck’s dialect, well, then I could write in Dallas’s. Instead of a raft on the Mississippi, Dallas and his friend Lonnie explored the world from the vantage point of a ’65 Chevy traveling the roads of California and Mexico. In the new book, Dallas goes on another journey, but he is a bit older and, hopefully, wiser—although not that much wiser. He is still a bit innocent, so he can also be compared to another seminal literary character, Voltaire’s Candide. He is something of a blank slate when it comes to politics, and he finds himself a bit out of his depth as he wanders into different political and social environments. For some readers of a certain age, I suppose it will be an exercise in nostalgia. For younger ones, I flatter myself in thinking it might be some sort of history lesson. I hate it when writers try to impose their opinions about current events onto some past era, although I understand it is a very hard temptation to resist. Writing about America in the 1980s, I could have easily have been lured into drawing parallels between that year’s presidential election and the one that occurred last year—if only I could have actually made heads or tails out of what happened last year. The comparisons, though, wrote themselves anyway. History now looks back at Ronald Reagan very differently from the way many people now look at Donald Trump yet, before he was elected, Reagan was seen by many as quite scary and his election came as a genuine surprise. This is not to say that Reagan and Trump are by any means similar human beings or that Trump will ultimately be seen as successful as Reagan was, but it is worth trying to keep some long-term perspective while in the middle of day-to-day political passions. If there is a political theme running beneath the surface of my novel, it is the way people tend to divide themselves politically, sometimes with disastrous consquences. Dallas’s journey not only involves the late 20th century culture wars in America but also the residual rift in Europe after World War II and how political divisions in South America led to horrible violence. Well, look at me, trying to make my silly old book sound profound. I hope some interesting insights did slip into the story but, in the end, my tale is ultimately about how we—mainly young men—get into all kinds of devilment out of boredom, confusion, and just trying to make some sort of sense of this crazy world.